Well, after all of the discussions on "The Board", we decided not to get another Basenji. Instead we have Evie, the Boston/Rat Terrier (aka a Brat). Mya just loves her and has been very gentle as time goes by. We didn't realize how very strong Mya was until we got Evie. Now we know she can definately fend for herself!! Here are the pups on their way to Grandma's for Christmas last week. OMG! She is so cute! How old is Evie? How big will she get? Why did you decide against another B? What a cutie!!! I think we need more pics! And the same questions as Jenn.. Why not a B-puppy? What a cutie. Looks like they are off to a great start as friends. Welcome Evie!! Be sure to keep us posted on what it's like to be a 'senji sister!! Momof…what a cutie you got. How did she pick you??? Well, to answer why not another B…. I talked to the breeder I wanted originally and she was not testing for Fanconi on all FOUR (2 males 2 females) of her dogs. I was really upset. I also tried to contact another breeder in MO and all of their baby B's are taken. 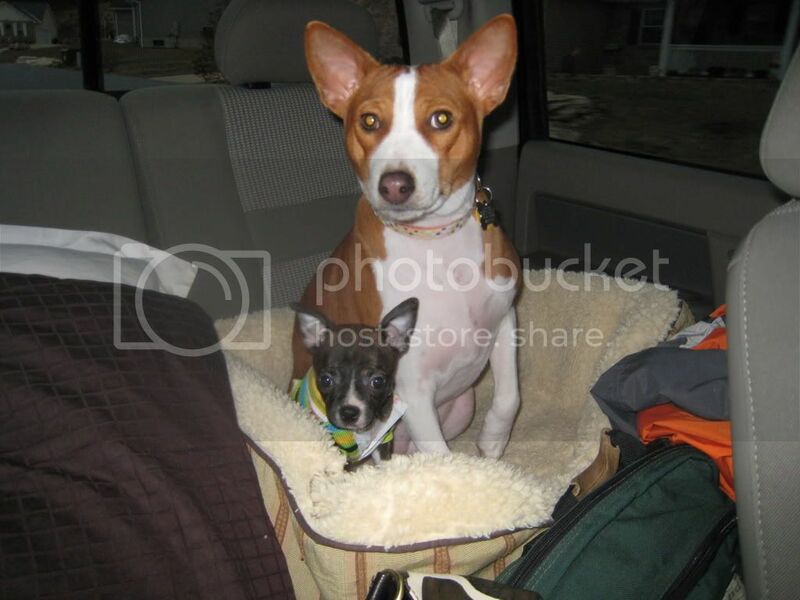 I contacted BRAT and they had a Basenji available in Michigan and I really don't have the time for travel other than to work and vacation and won't fly a pup. I went to get Mya a birthday gift for her first birthday. A friend of mine said she had BRAT puppies. I automatically thought B Rescue. She meant BRAT...part Boston Terrier part Rat Terrier...BRAT. I took her to our vet and she said that we couldn't have picked two better breeds. Evie will escape respiratory problems that Boston's have because she has a Rat nose (which is longer). Our vet also said that little miss Eve will most likely live to the ripe old age of 16 years and will hopefully die of old age. That was it!!! Old age won us over. I love my little miss Mya. I love Basenjis. But the thought of Fanconi kills me. The thought of Mya getting too spoiled to wait another year was hurting too. Mya is well socialized; however, she can really terrify other dogs just by the way her hair stands and her tail doesn't wag to greet them. This was perfect timing for us and for Mya. Thanks for the nice comments. When I update, I'll be sure to post videos of the pups playing. Wow, she's so teeny tiny! very cute! Aww so cute! Sorry you got misled by your friend's BRAT but you at least have one! Congrats!!! she looks so sweet…. Here's an update. I have a very close friend of 27 years. We don't talk often and don't see each other very much as we've gotten older. I sent her a picture of Evie after I got her. Unfortunately, my friend's dog (Murphy….rest his soul) had recently been killed so she wasn't really paying attention when I sent my email. She called lastnight and said she had gotten a Boston/Rat Terrier. I said that's what Eve is! She asked where I had gotten her - and she had received Evie's brother!!!! What kind of coincidence is that?? Wow! Definately ment to be…. Are you going to visit her brother once in a while? We'll definately be getting together for play dates. Mya will have to endure their terrier attitudes though. I'm sure she can handle her own!